Schooooooooool's out for summer! Schoooooooool's out for-ever! So many thanks to my fellow West Coast Conference member Loyola Marymount University for this simple, yet very useful and fitting, idea to use a special graduation hashtag. I don't even want to think about my college grad year. Depressing. I'm old. Over the years, I've learned an important lesson during commencement: Graduating seniors are BORED out of their gourds during the ceremony. And what do you do when you are completely bored? Play on your phone, natch. So many tweets, Facebook comments, Instagram pics... and really, wouldn't you rather be doing that than sitting for hours and listening to some boring old dean mispronounce everyone's funny middle names? I've tended to stick with just encouraging people to use the general institutional hashtags for big events, but I like the idea of having something special and unique for graduation. It just feels right - graduation is a big deal after all, and warrants some special treatment - and it would be really easy to promote, both online and with a couple of simple posters in the queuing area on the day itself. I also think an event hashtag has the potential to get more people involved, because it makes it just that much more special for them on their big day. So... yes, I'm going to be stealing this idea. Tomorrow. 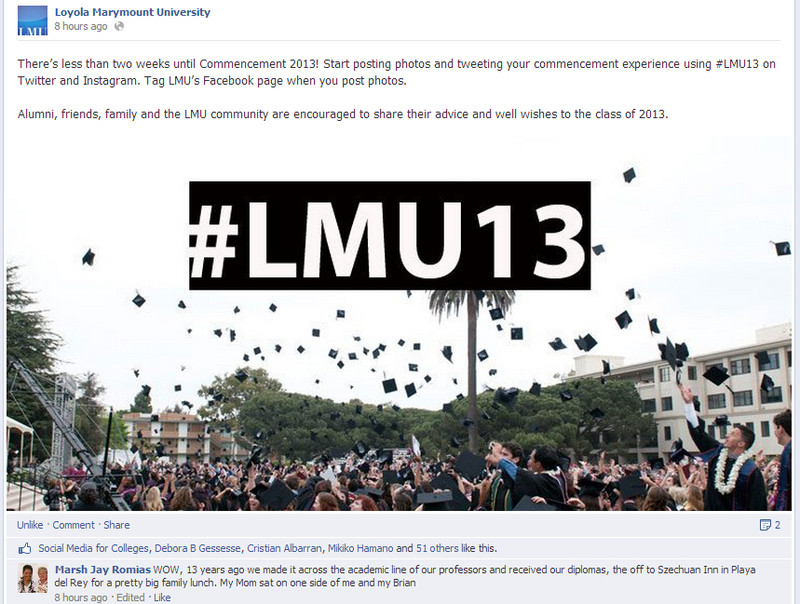 Thanks LMU! #UP2013 here we come.